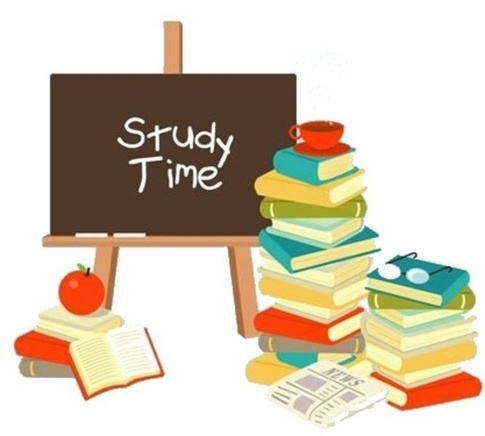 Library hours for the reading and exam period, Thursday, December 8th – Thursday, December 22th, are 8:00am – 2:00am. The circulation desk will close at 12:00am every night during this period. On Friday, December 23rd we will be open from 9:00am – 5:00pm. This entry was posted in 1Ls, BLS Students, Brooklyn Law School, Library Hours, Library Info, Study Rooms on December 1, 2016 by Linda Holmes. 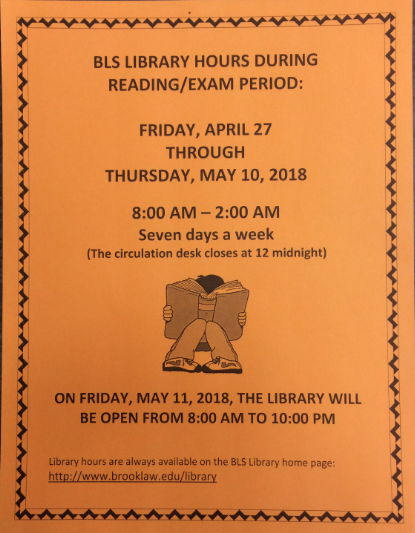 Library hours for the reading and exam period, April 27th – May 12th, are 8:00am – 2:00am. The circulation desk will close at 12 Midnight every night during this period. On Friday, May 13th the Library will be open 8:00am – 10:00pm. Please note that the Library will be open 9:00am – 12Midnight on Saturday & Sunday, May 14th & 15th for the Writing Competition weekend. Good Luck on Your Exams & Have a Great Summer! This entry was posted in BLS Students, Library Hours, Library Info, Study Rooms, Writing Competition on April 15, 2016 by Linda Holmes. 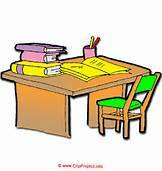 During the reading and exam period all students must make a reservation to use a library study room. Mandatory study room reservations will begin this Friday, December 4th at 8:00am. All study rooms will be locked on Friday, December 4th. In order to access your reserved study room, you must go to the first floor circulation desk to charge out the key. 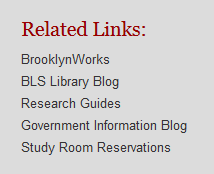 The link to the study room reservations is on the library homepage under “Related Links” on the right side of the page. On Wednesday, December 23rd, the library will be open from 9:00am – 5:00pm. This entry was posted in 1Ls, BLS Students, Brooklyn Law School, Library Hours, Library Info, Study Rooms on November 30, 2015 by Rosemary Campagna. No eating in the library, including the elevator corridors. No talking in the reading rooms, and please keep your voices down while using the study rooms. Please do not move chairs from room to room on the 3rd floor. Study rooms must now be reserved through the online reservations system; each student may reserve one room for up to for hours per day. And now for the good news: Ear plugs, if needed, are available at the circulation desk and chocolate candy will be available each day next week at 12Noon at the circulation desk. This entry was posted in BLS Students, Library Info, Study Rooms on April 30, 2015 by Linda Holmes. It’s that time of the year. The Library is full of students all studying for their exams. 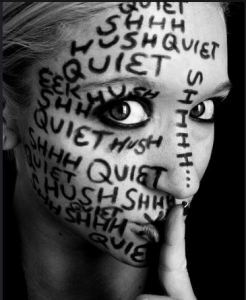 We are asking for your cooperation in keeping the library a quiet space for everyone to study. We have already received some complaints about loud talking and laughing coming from closed door study rooms. Please remember to keep your voices down when you are studying in groups in any of the numerous study rooms throughout the library. Even though the door may be closed, your voices travel. 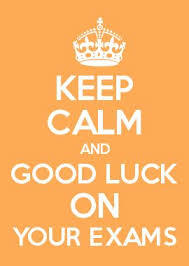 Thanks and good luck to all on your upcoming exams! 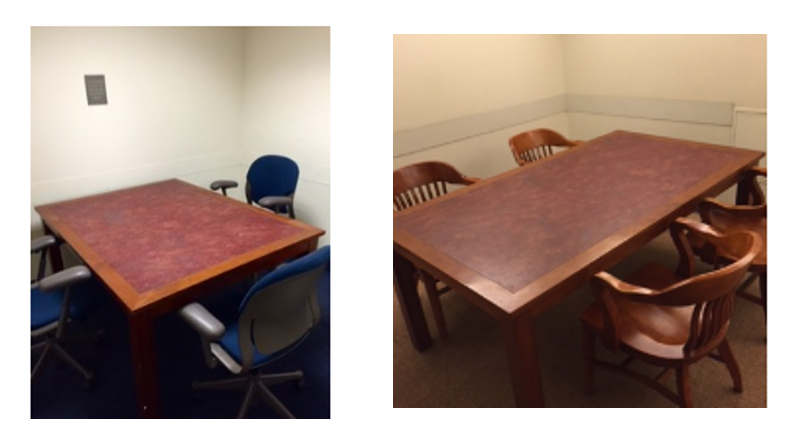 This entry was posted in 1Ls, BLS Students, Study Rooms on December 3, 2014 by Rosemary Campagna. During the reading and exam period, you must make a reservation to use a library study room. Mandatory study room reservations will begin on Thursday, December 4, 2014 at 8:00am; at that time all study rooms will be locked and you must go to the first floor circulation desk to charge out the key to the room at the time of your reservation. The link to the study room reservations is on the library homepage under Related Links. December 4 – 18, the circulation desk closes at Midnight; no books can be checked out after Midnight. Please limit all conversations in the library; remember that your colleagues are studying too. There is no eating in the library; please go to the student lounge or dining hall for snacks and meals. Do not leave valuables unattended. If you step away from your study table or carrel, take anything of value to you with you. Good Luck on Your Exams & Happy Holidays! This entry was posted in 1Ls, BLS Students, Library Hours, Library Info, Study Rooms on November 25, 2014 by Linda Holmes. During the reading and exam period, you must make a reservation to use a library study room. Mandatory study room reservations will begin Friday, May 2, at 8:00 am; at that time all study rooms will be locked and you must go to the first floor circulation desk when your reservation time begins to charge out the key to the room. The link to the study room reservations is on the library homepage under Related Links. · Please limit all conversations in the library – remember that your colleagues are studying too. · There is no eating in the library; please go to the student lounge or dining hall for all snacks and meals. · Do not leave valuables unattended. If you step away from your study table or carrel, take anything of value to you with you. This entry was posted in 1Ls, BLS Faculty, BLS Students, Library Hours, Library Info, Study Rooms on April 24, 2014 by Rosemary Campagna. During the reading and exam period, you must make a reservation to use a library study room. Mandatory study room reservations will begin Thursday, Dec. 5, at 8:00 am; at that time all study rooms will be locked and you must go to the first floor circulation desk when your reservation time begins to charge out the key to the room. The link to the study room reservations is on the library homepage, under “Related Links” on the right side of the page. This entry was posted in BLS Students, Library Hours, Study Rooms on December 2, 2013 by Rosemary Campagna.